With more than 300 participants, the LSR-seminars, to which ENGEL, Dow Corning, and Elmet issued invitations in mid-December and which were held in Shanghai and Dongguan, were a huge success. Intelligent system solutions that process liquid silicone rubber (LSR) for the highest efficiency and lowest unit costs, were the focus of lectures and live demonstration. ENGEL and its system partners provide turnkey systems from a single source, because only when all system components and materials are perfectly matched from the beginning can the efficiency potential be exploited to the maximum. ENGEL, Elmet, and Dow Corning demon-strated how this looks in practice, producing sealing rings on an ENGEL victory 110 injection moulding machine. The manufacturing cell was equipped with a mould manufactured by Elmet, and injection unit, feeding units, and metering pumps especially developed for LSR processing. During the lectures, the organisers went into detail on the requirements, potentials, and trends of LSR processing. “Multi-component applications, such as hard/soft combinations for baby products, will significantly increase in China,” says Dr. Hans-Peter Wolf, Global Re-search and Development Manager for Silicone Rubber at Dow Corning. In his lecture, he presented innovative raw materials from the Xiameter product range that are preparing the way. In two lectures, Leopold Praher presented injection moulding solutions for processing LSR as well as solid silicone, and Paul Fattinger, Sales Manager at Elmet in Asia, explained special mould concepts, LSR pumps, and mixing units. 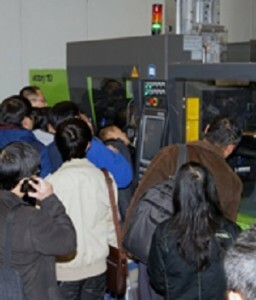 At the end of the Shanghai seminar, the participants had the opportunity to visit ENGEL’s production plant. ENGEL is building large-scale machines of the ENGEL duo series on-site. Injection moulding machines with low and medium clamping forces, such as those in the ENGEL victory series, are produced for the Asian market in Korea. ENGEL is the only west-ern injection moulding machine manufacturer in Asia with two production plants. “Thanks to decentralised production in Asia, we can assure our customers of short lead times and ac-commodation of the injection moulding machines and turnkey solutions to the specific re-quirements on site”, says Gero Willmeroth.